Lately small businesses have been bombarded with strategies and tricks to improve SEO efforts. … tonight at midnight the price to get instant access to Unlimited Web Traffic – ten calls, ten transcripts and the exclusive Guide to Unlimited Web Traffic – goes up. Today you have a choice. Last week I interviewed eleven of the world’s top web traffic experts to show you exactly how to flood your site with qualified prospects so you can make more money this year. 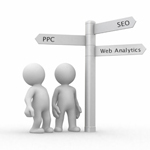 Are you a small business owner who runs PPC campaigns? Have you spent hundreds, maybe even thousands of dollars, and not known if any of your ads have brought in a single sale? Google Adwords with her seemingly targeted traffic, easygoing daily budgets, and conservative broad matching makes you think you have found the perfect solution to your marketing needs. For your small business marketing you need to understand the tools and pick the right one for the right job at the right time. You cannot effectively compete without at least considering all the marketing channels and that certainly includes both SEO and PPC. The issue is not “Either Or.” It is about the balance, frequency, and audience. Google Adwords Mistake. Are you paying to go nowhere? I’ve been clicking through the google adwords for a recent project and every 10th ad or so I run into the same problem. I see an ad I like. I click on it to view the service providers’ website and get a not found page. The answer is yes and no. Google’s elegant Adwords system makes it easy to set up and test ads but most web site owners never make a profit from their ads. For most people Google Adwords are the number one website marketing money waster. Once a prospect clicks on your Google Adwords ad, they’re linked to your site. Then what happens? In most cases a whole lot of nothing. They visit your site or your landing page and then they leave. They leave without buying anything or even leaving you their contact information. The result of your Google Adwords campaign? For most people, it’s another advertising black hole. A whole lot of money goes into it and it doesn’t generate much in the way of business. That’s not to say it can’t work. I have one web site marketing client that relies primarily on Google Adwords to generate leads and sales. And their business is booming. But it costs them plenty, more than most people realize to generate a lead. When I first started working with them their per lead cost was over $75 dollars. That’s right they were paying for more than $75 worth of Google Ads just to get one person to fill in their opt-in form on their site. Now, they’re absolutely delighted that I’ve helped them reduce it to less than $25 per lead. Why does this work for them? Google Adwords works for them because they close enough of their leads to make a huge profit. Will Google Adwords work for you? To make them work you need to determine your per lead costs, conversion rates and the value of a new client. If it’s less then you’re paying for your Google Ads, then you need to either stop or discover how to increase your conversion rates so a higher percent of visitors to your site or landing page become buyers. Don’t be hoodwinked by this website marketing hoax. Don’t assume Google Ads will automatically start bringing in business. They won’t – unless you know how to convert site visitors into highly profitable clients. How can you improve your small business marketing with your Google Ad campaign? Before you rush into spending money on your Google ads, it pays to understand how they work and their purpose in your small business marketing. With the right verbiage you could create an ad that generated hundreds and thousands of click-throughs to your small business. Would that help your small business marketing? It depends on how many of the people who clicked on your Google ad actually turned into small business clients as a result of your marketing. You could have the world’s greatest Google ad with a click-through rate of 3-5%, but if the people who click on your ad aren’t buyers then you are just wasting your money and lots of it. To make sure your ads are not only working to attract prospects, but are also working to generate sales do the following once a month. On a piece of paper list each of your Google ad campaigns. In the next column to the right, list the amount $ you spent on that campaign. Then in the third column over, list the dollar volume of sales directly attributed to that Google ad campaign. Here’s what you may find out about marketing your small business. Ads that get the most clicks and bring the most people to your web site aren’t necessarily those that generate the most sales. Other ads that have a lower click-through rate may bring in more bonafide clients. Based on your monthly data analysis you’ll discover which ad campaigns to cut and which to spend more on, resulting in more sales. Can I Rely On Search Engine Placement? Given the vagaries of the search engine algorithms and the volatile nature of the search engine marketplace I’d advise your client to develop multiple ways to generate leads over the internet. He could be doing very well with his Google search engine placement this year, but if Microsoft has their way, they’ll be putting Google out of business and his search engine placements could be irrelevant.